"How to build a quilt frame"
Here you will find free quilt frame plans that were made and used in almost every household. They were simple and easy to make. Some were large enough to hold an entire quilt where many ladies could sit and quilt at the same time. And than there were the smaller frames that would hold only half a quilt at a time. Of course we often see the quilting hoops which are so very handy as they only take a fraction of the space and is easy to use on your lap. Large hoops are about 22 inches in diameter are also great for quilting. The advantages of a quilting hoop is that it enables the quilter to get closer to the work and is much more convenient. This is also easier to hand and takes much less space. 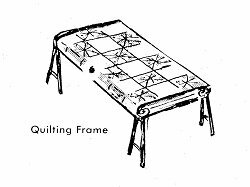 There are different types of quilting frames, some are like the picture above or the picture below. But the main thing is that the quilt is kept flat and taut while quilting. You can make the frames out of wood or pvc, which is very popular today. With these free quilt frame plans you will find the plans for wooden frames in the old style. The authentic way to quilt is to have a large frame into which the whole quilt is stretched. The frame itself is so simply constructed that every household used to have its own. Each frame will have two horizontal bars. These two bars will be, 2 inches wide and 2 inches deep and about 92 inches long. These long horizontal bars are held in place by 2 vertical bars. The vertical bars are 2 inches wide and about 2 feet long which have a contrivance for controlling the horizontal bars. 1 - Cut two pieces of fabric (one for each 92 inch bar) Each piece should measure about 12 inches by 80 inches. 2 - Hem the short ends of both pieces with a 1/4 inch seam allowance. Repeat this for both pieces of fabric. 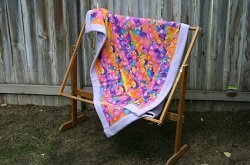 3 - Completing one piece at a time, fold the 80 inch fabric in half making it 6 inches by 80 inches. 4 - Place this tube on the 90 inch bar centering it, leaving 6 inches of wood exposed on each end. 5 - Using a staple gun (or small nails ) attach the fabric to the long bar. Keep the staple close together all the way across. 6 - Repeat with the other fabric piece and the other long board. After you have basted all three layers of your quilt it is time to place on the frame. 1 - Stitch the bottom of the quilt to the fabric you placed on the long bar. Remember to use quilting thread as this is much stronger than regular sewing thread. Now stitch the other end of the quilt to the frame. 2 - Roll one end of the quilt up on the long boards until you reach the width of the vertical bars. You should now have about 2 feet of quilt working area. 3 – Use C-clamps on each corner to secure the boards together. 4 – You can than place the frame on saw horses.